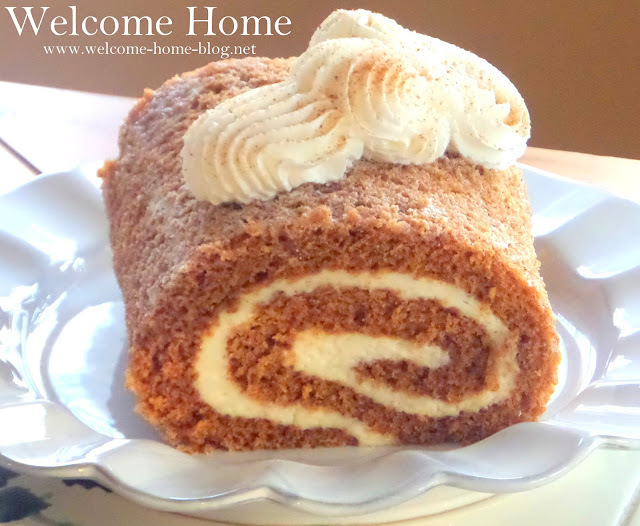 As soon as I see my first pumpkins in the fall, I immediately think of making pumpkin rolls. Everyone loves them and they make a gorgeous presentation. I make them ahead of time and freeze them to give as gifts to friends and family. They just say autumn don’t they? What could be better than a moist and spongy cake rolled around a creamy filling of sweet cream cheese and topped with the perfect amount of whipped up cinnamon spiced whipped cream? Line a 15 X 10-inch jelly roll pan (a cookie sheet with sides). Next cut a sheet of parchment paper to fit the pan leaving an inch or so to overhang on each end of the pan. Then lightly grease the parchment paper, including the sides of the pan. Make the cake: Mix the sugar, flour, salt, soda, cinnamon, eggs and pumpkin in a large bowl. Once mixed, pour mixture over the waxed paper. Bake for 14-15 minutes or until center springs back when lightly touched. Arrange a large but thin, clean damp cotton kitchen towel on the counter. Do not use a regular dish towel that might leave impressions or fibers in your cake. I like using a tea towel. Make sure the towel is only damp and not wet. Spread a thick dusting of powdered sugar all over the towel. Next turn the baked cake upside down on the towel so the parchment paper is on the top. Gently peel off the paper, being careful not to tear the roll. While the cake is still hot, roll the the cake up in the towel, starting at one of the short ends. Let cake sit in the towel on a cooling rack until completely cool. Make your filling: Mix the cream cheese, butter, vanilla, and powdered sugar together until it is light and creamy. Set aside. Once the roll is cool, unroll it from the towel and carefully spread your filling in an even layer over the cake. Next, roll the cake up again without the towel and wrap in plastic wrap. Refrigerate for about an hour before serving. roll with a dollop or pipe on as I did.